So I’ve been on this cleanse that doesn’t allow me to have sugar, dairy, or gluten (among other things.) You know I have a sweet tooth – hence the name minimalist BAKER? Well, to say the least, it’s been a STRUGGLE. A fruitful, eye opening struggle, but a struggle nonetheless. So what’s a cleansing girl to do when she has a mean ice cream craving? Make a super healthy substitute that’s perfectly acceptable in moderation. Still trying to get the whole ‘moderation’ part down, but I’ll give you an update after my next ice cream recipe (next week!). This recipe turned out far better than I expected, considering that it contains no dairy or refined sugar. Rich, full-fat coconut milk and unsweetened almond milk marry together to create a thick, creamy base. Honey and dates add a natural sweetness. And green tea provides both vibrant color and flavor. This recipe is customizable if you don’t have dates or prefer not to use honey, if you’re vegan. You can sub raw sugar, and you can omit the dates altogether and replace them with honey. You can also cut the sweeteners back for a less-sweet, more vibrant green tea flavor. The cool thing is the batter contains no eggs so you can dip your finger in and taste it as you go. Also, no heating required – just a blender or food processor. Simple simple simple. But you must – MUST – use high quality coconut milk, not the generic kind that’s $1 cheaper. It won’t be nearly as ice creamy. I went for an organic brand and you can tell it’s high quality when you open the can because a thick almost 3-inch layer of coconut cream has settled over the milk portion. That’s when you know it’s the good stuff. I loved how present the green tea flavor was, almost earthy and grassy at moments. It reminded me of a recent trip to a sushi restaurant when they brought out fried green ice cream for dessert, only mine is healthier. Sorry, but it is. 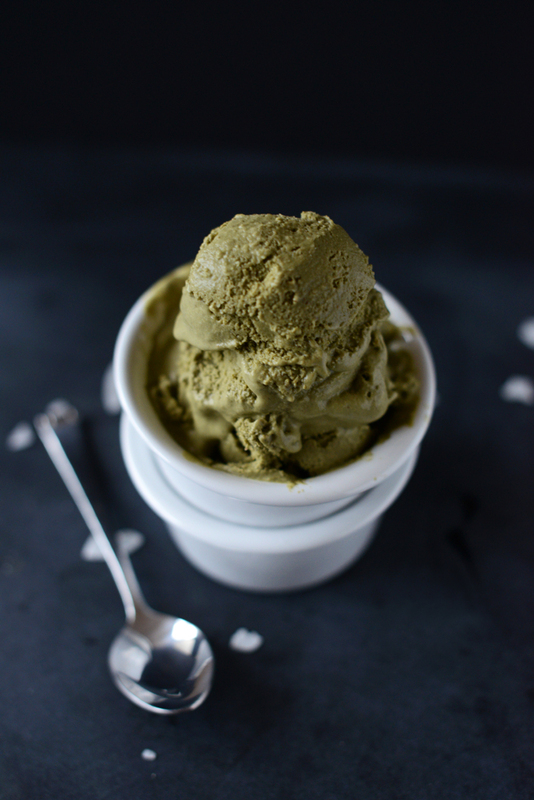 Creamy, green tea ice cream with a coconut-almond milk base and sweetened with honey and dates. Creamy, earthy, so delicious. Place coconut milk, almond milk, matcha, dates, and honey in a blender and blend until well combined. Add xanthan gum and mix again. Taste and adjust flavor as needed, adding more green tea powder, dates, or honey. Will keep in the freezer for a week or so. Best when consumed fresh. I'm sure it would be lovely with pomegranates, fruit compote, or cacao nibs. Hi! so excited to try this! do i use the whole can of coconut milk, including the water, or just the rich cream that sits at the bottom? Also, should the can be refrigerated before use? what about using coconut cream instead of coconut milk? Hi Lynn! We have found coconut milk to work best, if you try coconut cream instead, let us know how it turns out! You mention replacing the dates with more honey. How much honey TOTAL (including the 1/4 cup already in the recipe) would be required? I’ll be converting the honey to sugar then converting the sugar to liquid sucralose concentrate. I have tried to make a few of your different ice cream recipes. To date, this is the only one that has come out with the consistency of ice cream! The ones previously have come out way too hard, frozen solid like a rock. Good for a popsicle, perhaps, but not ice cream! I took preventative measures from this happening again and added a splash of vodka. I also spun it around in the blender for a bit again before churning… I think the extra air in there helped fluff it up. 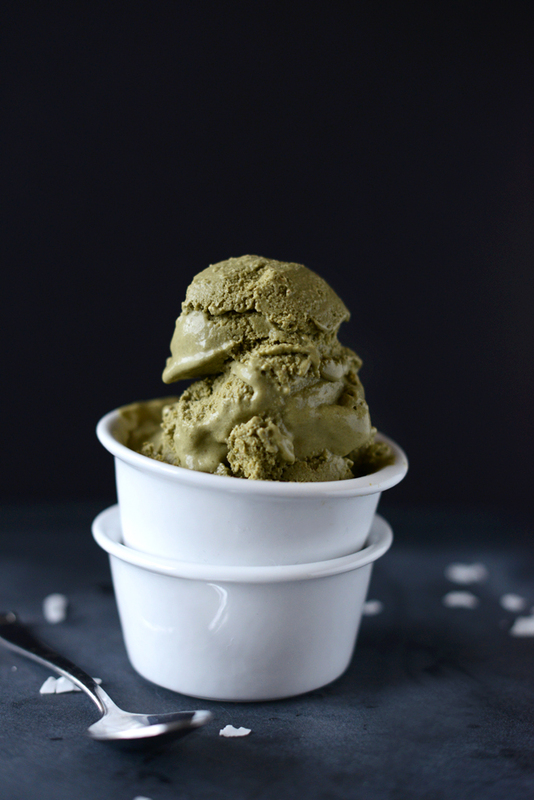 Green tea ice cream was my favorite as a kid and I was glad to eat it once again! This was a very easy to make recipe, but I must admit that I was hesitant to try it at first because there were no instructions to heat the mixture before chilling it. My fears of making something weird aside, I gave it a try substituting coconut cream for the almond milk, and rice syrup as sweetener. Fantastic results, and I was surprised at how well everything held together. Very creamy indeed. The resulting ice cream was not too sweet and had a rich hint of coconut. This was a very intelligent application of the sweet properties of dates, and I applaud your sharing of the recipe. The techniques from this will be useful for other desserts. Wow, this recipe looks so good! Matcha and coconut… too good! Could you use brewed green tea instead of matcha powder? This was a wonderfully rich, creamy flavorful scoop of icecream! I made the mistake of using a can of full fat coconut milk that already had sugar in it and didnt realize it until after i had added the honey and dates–so initially it was way too sweet… i added an unsweetened can of coconut cream in the final mix to the ice cream maker and it came out ok! My second round, i followed the recipe exactly and it was absolutely delicious. Thank you for another great recipe. I am always looking for a new healthy refreshing treat during the summer. I can’t wait to try this one. Thanks for sharing! Can agave be substituted for the honey or maple syrup? If so, same amount? only use honey you produce yourself that doesn’t exploit bees (by renting or pimping them out) if you don’t know what i am talking about you need to read up. I love Whole Foods 365, Native Forest, and Trader Joe’s. I’m embarrased to ask this but, for this recipe is “coconut milk” the canned stuff or is it the coconut milk in the carton (similar to soy, oat, almond milk)? I Really want to make this recipe. Only question I have is: Is Xantham gum absolutely necessary ? Can I use chia seeds as a thickener? I’d rather stay away from xantham gum, starches and other gut irritating thickeners. I can’t wait to make this for my sister for her birthday! Green tea IC is one of her favorites; I’m sure she’s never had it homemade, though! 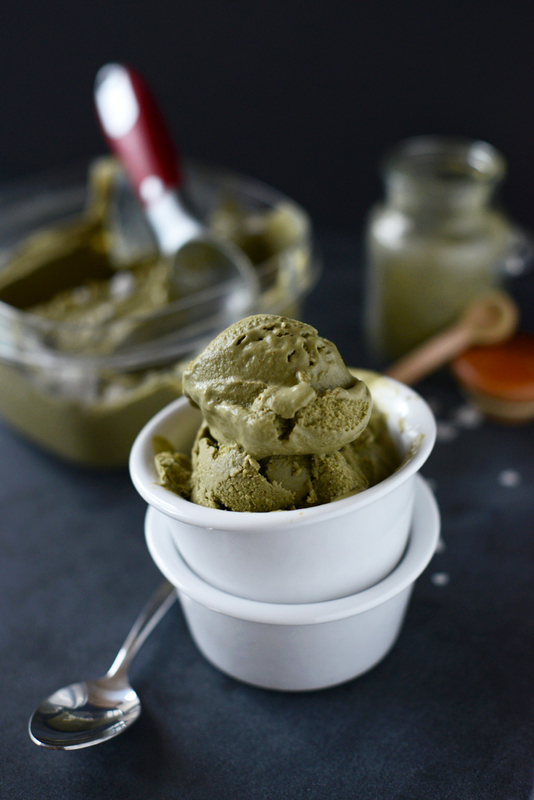 Where does one get- or how does one make- Matcha green tea powder?? Sounds fun! I don’t think it’s worth trying to make your own Matcha powder as it won’t be the right consistency or flavor. I’d recommend snooping around this post from Lunchbox Bunch! It’s extremely extensive and includes links for purchasing! Good luck. Wow, thanks very much for posting this! It is going to help when I research green tea at the store! So Impressive! 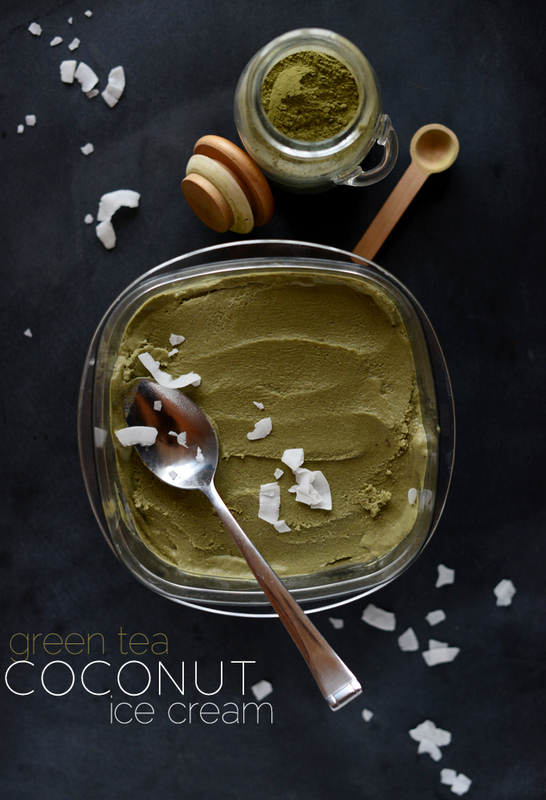 Now this looks amazing, I love green tea and coconut! Do you think this recipe would work with the frozen bananas instead of the almond milk and xanthan gum? It will be much more icy and taste banana-y. But if you’re OK with that, then yes! Hope that helps, Kayla! What size can of coconut milk/cream are we talking, here? I live a sugar-free lifestyle, but this looks like a yummy treat on those days when I feel like something sweet. Dates are such a great sweetener! I’m curious, could you brew up some green tea and add it instead of the powder? Thanks for the great recipes on your site! Amber, great question! Actually brewed green tea won’t work the same as powder in this instance. It would make it too icy and thin. And yours has honey..so you know how I can substitute that for stevia? I’m new at this and would appreciate any help! I make various stevia sweetened coconut milk Ice cream flavors often. 1/2-1 teaspoon of liquid/glycerin NOW Brand Stevia is a good starting point. (any brand or form should work, you will have to taste it. You want the “batter” to be a bit sweeter than you want the finished Ice cream to taste. I also always add a very small pinch of salt to the batter (any flavor ice cream) it seems to help blend the flavors together. I’m having some difficulty finding xanthan gum. I’ve tried researhing alternatives, but I’ve only confused myself more and I want it to turn out perfectly! What can I do? You can apparently substitute corn starch or arrowroot powder. Hope that helps. Most health food stores have xanthan gum, though. Green tea ice cream is probably my favorite flavor. Being half Japanese, I’m pretty spoiled when it comes to authentic matcha ice cream. I’m so excited to try this recipe at home!! Being a fellow minimalist, I would rather use something already in my pantry then buy something else (if possible). I have no green tea powder, but I do have green tea bags. Can I sub? Penny! Glad you’re a minimalist, too! The simple life is one we can get used to :D on the green tea powder, it’s not easily replaced with bagged green tea. BUT, if you can find a tea or spice shop where you live you can likely guy it smaller more affordable quantities. Hope that helps! Looks awesome! However, I was wondering, are any there alternatives to xanthan gum? Some people seem to use chia seeds, but would these work for ice (s)cream? If so, what quantities would you recommend? The xantham gum is a deal breaker for me. I would like to know if there is a substitute for it, too. I go on cleanses like this every so often, so I’m always looking out for sweets I can enjoy during those days (I, too, have a major sweet tooth!). This looks gorgeous! OH GOSH!!! I used to splurge on the So Delicious brand of green tea coconut ice cream when I lived in an area that carried it. Now that I don’t, this recipe, with its no refined sugars, is a DREAM COME TRUE! THANK YOU!! 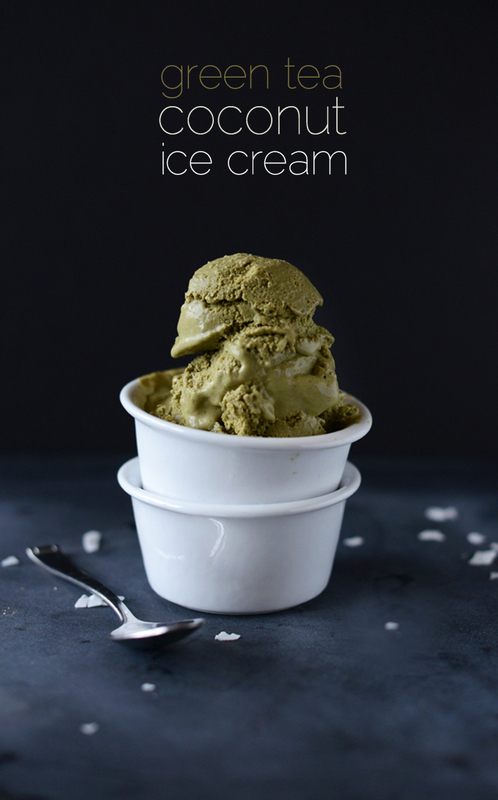 I’ve never had green tea ice cream before, but it sounds delicious! Oh my, these photos are stunning! 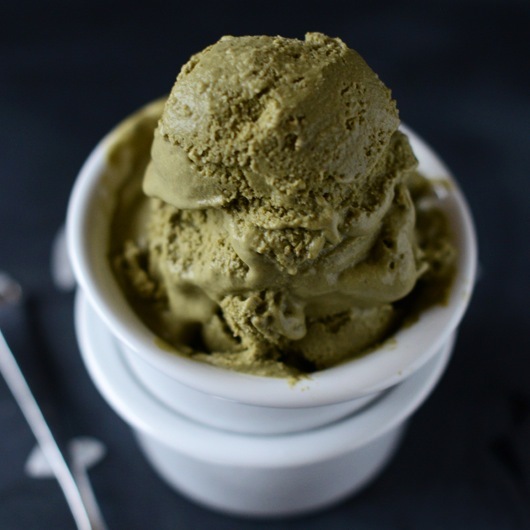 I LOVE green tea ice cream; this looks like a fantastically healthy take on it. Kudos to you for your cleanse, and for making stellar desserts regardless! ice cream is considered fat building food in general…but having an ice real with coconut and green tea sounds very interesting….yummy!!! can still have ice cream and be able to lose weight !!! great idea! love the falafel, LOVED the grapefruit dranks (need details on how you did that photography) + this ice cream looks delightful. i want to make it with a wee bit of ginger, how’s about that? hope you had a great week. let’s catch up on the phone next week (and yes, i realize i never got to your email…LOVE YOU). In the third paragraph you say that you can replace dates with dates…for those of us who aren’t sugar-free, what’s a good substitute? Thanks! Love coconut ice cream. I’d use raw or granulated sugar! I make various stevia sweetened coconut milk Ice cream flavors often. 1/2-1 teaspoon of liquid/glycerin NOW Brand Stevia is a good starting point. You want the “batter” to be a bit sweeter than you want the finished Ice cream to taste. I also always add a very small pinch of salt to the batter (any flavor it seems to help blend the flavors together. I love green tea frozen yogurt! I can’t to try this ice cream! Would you believe we got a nice ice cream maker over two years ago as a gift and still haven’t used it? This looks really good! This looks amazing! Thank you for providing the non-ice cream maker version. So pumped to make this! This looks amazing, and your photographs are beautiful! I made a matcha tea donut for the book and was kind of shocked at how delicious the flavor was and it turned the donut green! :) I have no doubt this is fantastic! Ever had a matcha tea latte?? SO GOOD! We always get green tea ice cream after sushi! I love this. Can’t wait to make it at home! Perfect timing! I’m on a refined sugar detox with a crazy sweet tooth. I may have to try it now with the no-ice-cream-maker method. That is so healthy delicious looking ice cream!! Good luck the cleanse!! Love your description of this as earthy – I’m really digging these kind of flavours at the moment. I’ve been reading your ice cream recipes and would love to try making one, but I don’t own an ice cream maker. Can you recommend one? I’ve read a lot of reviews but it doesn’t seem like there is a “best” one. Thanks and keep cooking! We actually borrow ours from a friend, so that might be your first option. It’s essentially this one on Amazon. We use this one. It works like a charm every time. Turn it on, walk away, and 20 min later you have icecream. Easy clean up too!